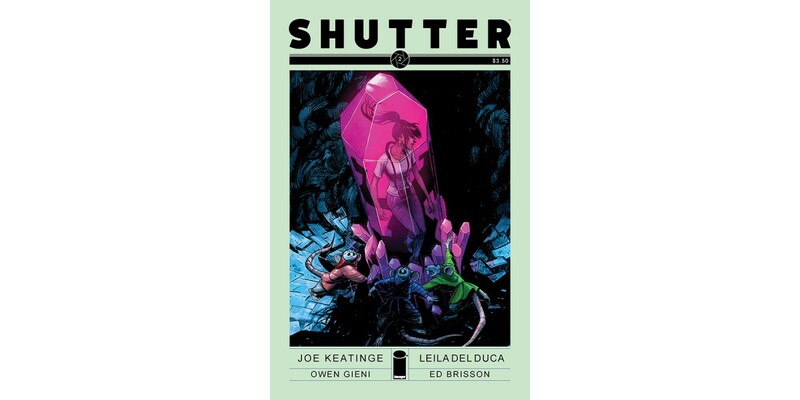 The second and third issues of the action-and-mystery-packed hit Image Comics fantasy adventure series SHUTTER, written by Joe Keatinge (GLORY, TECH JACKET) and drawn by Leila del Duca, have sold out completely at the distributor level and are being fast-tracked for new printings to meet customer demand. Kate Kristopher, the star of SHUTTER, left behind the life of adventure her father left to her in favor of something approaching normalcy. Now, however, her secret siblings are crawling out of the woodwork, she's being hassled by rat kids in cute outfits, and must face down assassins of all stripes, themes, and species before finally discovering what other secrets her father kept from her. Beautifully drawn and full of old-school adventure, SHUTTER’s adventure is just beginning and there’s no better time than now for readers to join her Indiana-Jones-style action-packed journey. SHUTTER #2 and #3 have completely sold out at the distributor level, but may still be available in comic stores. They are currently available digitally on the Image Comics website (imagecomics.com) and the official Image Comics iOS app, as well as on Comixology on the web (comixology.com), iOS, Android, and Google Play. Image Comics is pleased to announce that both these issues will be going back to print to meet customer demand. The second printing of SHUTTER #2 (Diamond Code MAY148087) and SHUTTER #3 (Diamond Code MAY148088) will release on 7/16. SHUTTER #4 will be available in stores on 7/9 and can be pre-ordered with Diamond Code MAY140729.